If your group wants privacy, great multi-species fishing and a variety of sites to fish, then Tornado’s Portage Lake Camp is the place. The Portage Lake Camp is often used as a starting point to reach the nearby Magnetewan River and/or the outstanding bass fishing at Crowe Lake, Finney Lake, Deep & Little Deep Lakes, Sunny Lake, but it is a good multi-species fishing lake in its own right. Portage Lake offers good fishing for smallmouth and walleyes, with some largemouth bass and northern pike. With fast-breaking shorelines, trolling is the preferred approach for northern pike and walleyes, while the shallow back bays and shoals provide good bass fishing. 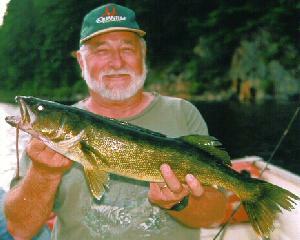 Live-bait rigs, minnow-imitating body baits and jigs consistently produce at Portage Lake. Portage Lake has multi-species fishing, walk-in bass lakes, guided American-plan packages, and room for larger groups (up to 12 persons). Just a short portage from the lake is the Magnetewan River (W, NP, SMB). Here, just upstream at Stovepipe Rapids, anglers enjoy consistent walleye fishing throughout May, June and into July. Downstream lies Little Island Lake, another great fishing / canoeing opportunity.